An Innovative new product to replace the cardboard forming tube. Made from partially recycled HDPE plastic, and available in 8”, 10”, 12”, 18”, 24”, and 30” diameters,the new CEME-TUBE™ will change the way footings and piers are made. This revolutionary new product will eliminate a multitude of problems found with using cardboard forming tubes. The CEME-TUBE® will not only take job site and shipping abuse, but it can be installed, completely backfilled, and filled with concrete at any future date. All CEME-TUBE®s are 4 foot in length, but with the integral collar on one end, can be stacked to produce piers up to 20’ tall in one pour. (12’ tall for 30” model) The finished pier will be round, smooth, equal in diameter, and of architectural grade for the entire length. 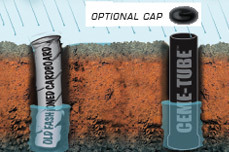 An optional domed cap is available in all sizes to keep rain, dirt, children etc. out of the hole prior to pouring concrete. Impervious to moisture, before and after pouring. Eliminates “Friction frost heaving” in colder climates. Can be installed, completely backfilled and then filled with concrete at any future date. Can easily handle job site and shipping abuse without losing integrity. Molded from partially recycled HDPE plastic and is flexible to -103 deg. F. The Ceme-Tube® will not chip or crack when cold. Unlike cardboard tubes, the diameters are uniform from one CEME-TUBE® to another. Easily cut with common power tools. Easily strippable using a grinder with any type of cutting or grinding wheel. Note: When stripping, only cut CEME-TUBE® approximately 90% through, score inside cut with a utility knife, and tube will split open with minimal effort. Works well for underwater dock piers. Will work in conjunction with all manufactured footing bells like Bigfoot. Optional domed top caps are available for all sizes to keep dirt, rain, children, etc. out of hole prior to pouring. Finished pier will be round, smooth, and of architectural grade. No more rotating form lines as with cardboard tubes. IMPERVIOUS TO MOISTURE. 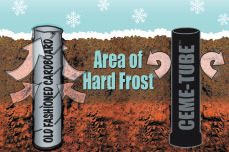 The CEME-TUBE® is impervious to adverse weather conditions, ground water, and all moisture. No more waiting to pour due to wet conditions or having to protect the tubes from the weather! WHAT IS FRICTION FROST HEAVING? Friction frost heaving is caused by the upper 1 to 3 feet or more of the ground freezing. This frozen ground will expand, grip and actually adhere to an unprotected pier from the sides. When the ground rises up with the frost, it can and will take the pier footing with it. NOT WITH CEME-TUBE®! Incorporate products into your plans quickly and easily by downloading our design files from CADdetails.com. The CADdetails program is developed specifically for design professionals with the goal of getting manufacturer-specific product information into their working plans. CEME-TUBE® is a Registered Trademark of Ceme-Tube®, LLC. Ceme-Tube® products are protected by Canadian Patent 2,644,000. Other patents pending. Copyright © 2019 Ceme-Tube®.All rights reserved.